I have been incredibly busy the past week or so. The weather has started to look promising, even if it still yo-yos back and forth between winter and spring. And because of the promise of nice weather, I've been motivated. I'm been running around trying to finish up all the projects I have going on. 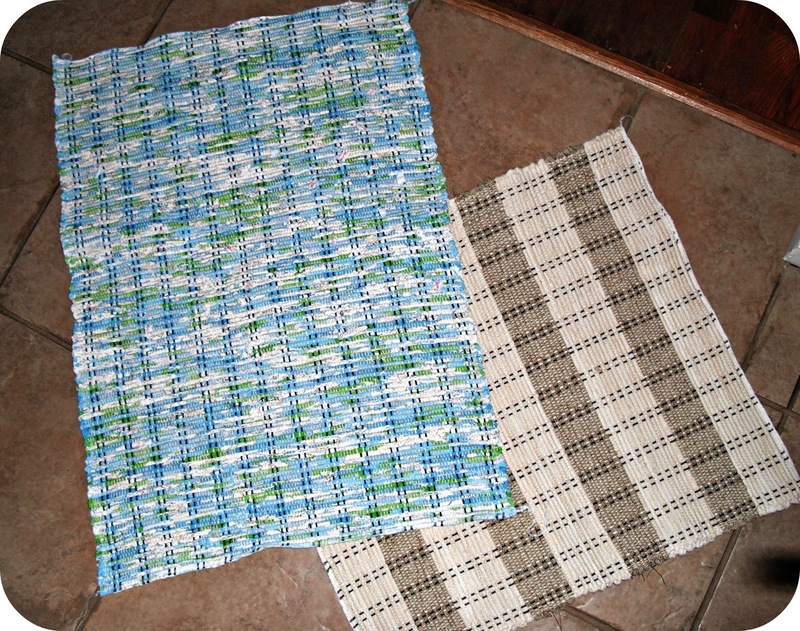 Both ones from my home improvement list and my craft list. And I have to say I'm starting to plow through it. LIKE A BOSS! And OMG. It feels wonderful!! It's like this burden has been lifted off my shoulders and I am almost, almost free to start any of the new projects I want to start. But, no. Not now, brain. Not now. You still have a few things left to accomplish before you add on to your ridiculous list. Let me show you a few things I am so stupidly proud of. Not because they are beyond amazing, but because they are done and I am so, so tickled that they are. FINALLY!! 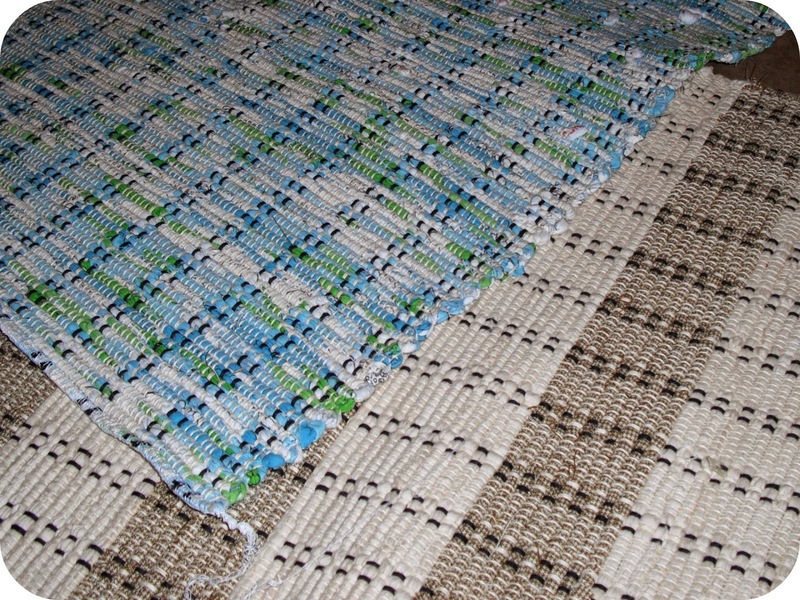 I finally finished off the edges of a few on my woven rag rugs. I chose to serge them to make the edges look cleaner. The blue and green rug I gave to my step-mom this weekend. She will be testing the durability of it for me. I'm just a bit weary about how durable the serged edges will be. If I plan on selling them down the road I want to make sure they will last. I hope it works out because I do like how crisp and almost modern it makes the edges look. 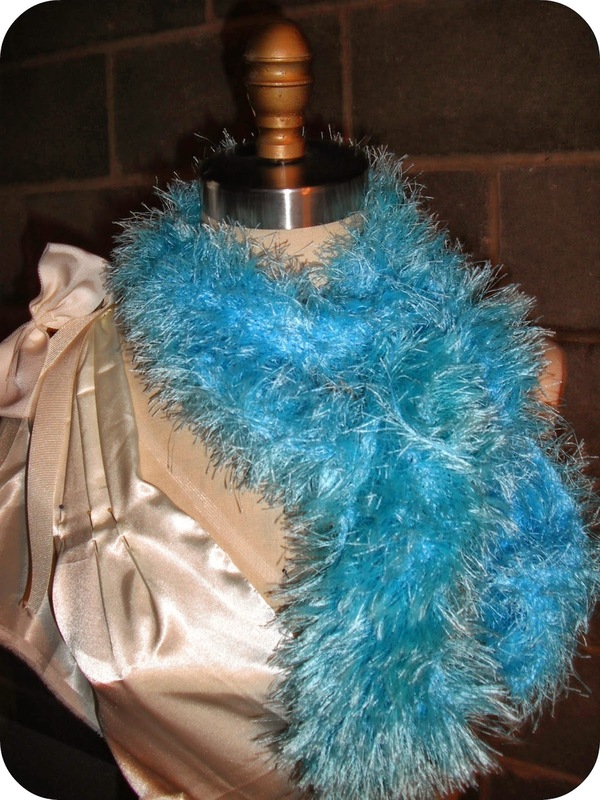 Here we have the Fun Fur Scarf. I finished knitting this last week. It is straight knit, through and through. Forgive me for not knowing what that stitch is called. I only dabble in knitting. Lucy is modeling it for me again. She is wearing a draped shirt idea with it. Isn't she stylish? And her hair is always perfect! If the blue fun fur looks familiar, you would be right. I snipped off a few pieces from my skein to make my daughter's "Thing 1" headband. 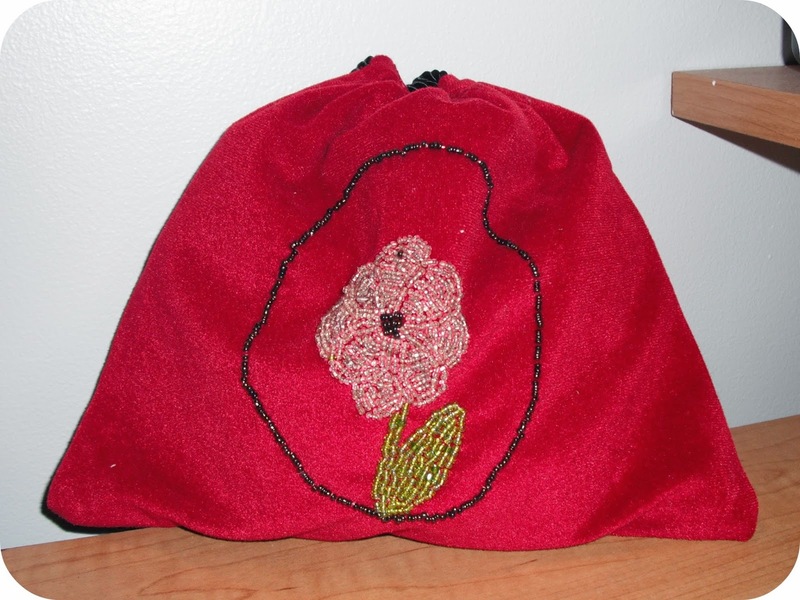 Then we have one of those pesky little bags I beaded. I did the stitching to close the tunnel for the drawstring and finished it off by using a random piece of cording as the drawstring. I didn't put two drawstrings in like it should have because the cording was thick and not cooperating. No matter, I think my little girl will like it anyways. All kids love things to put in other things.Total truth. 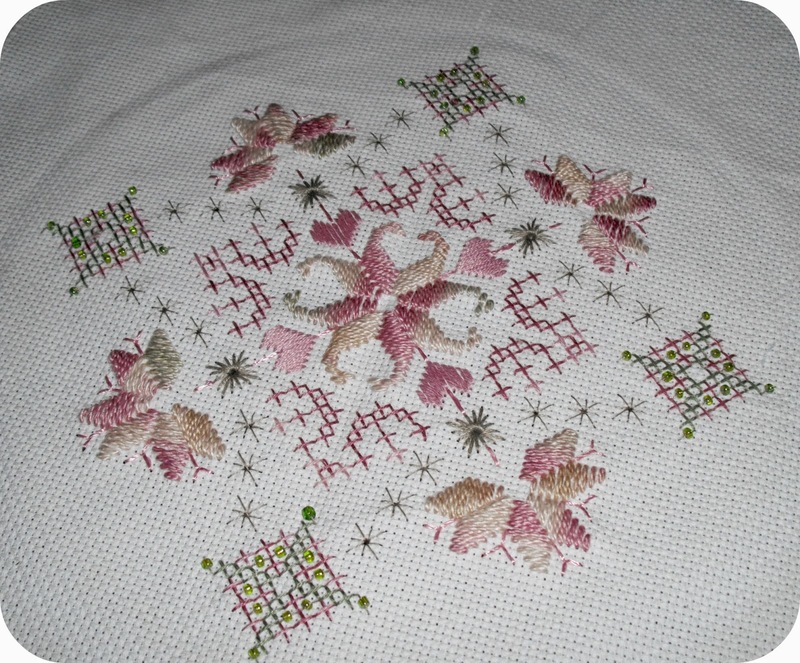 And the grand finale is my beaded cross stitch I swear I started ten years ago. Yes, Don't mock me. I didn't work on it for like... 8 years. It was so hard to get a good photo of this because the colors are pretty pale and pastel. Does anyone know how to get my hoop indent out? I already tried pressing and steaming it. Who knows what is next on my wicked list of unfinished projects. I may be finishing up some crocheted barrettes or mend a baby granny square blanket (since I finally re-discovered the pattern I used). Look at the cute baby playing peekaboo on top of it. Look at the pretty yarn and I better draw out that dress idea while I can remember. 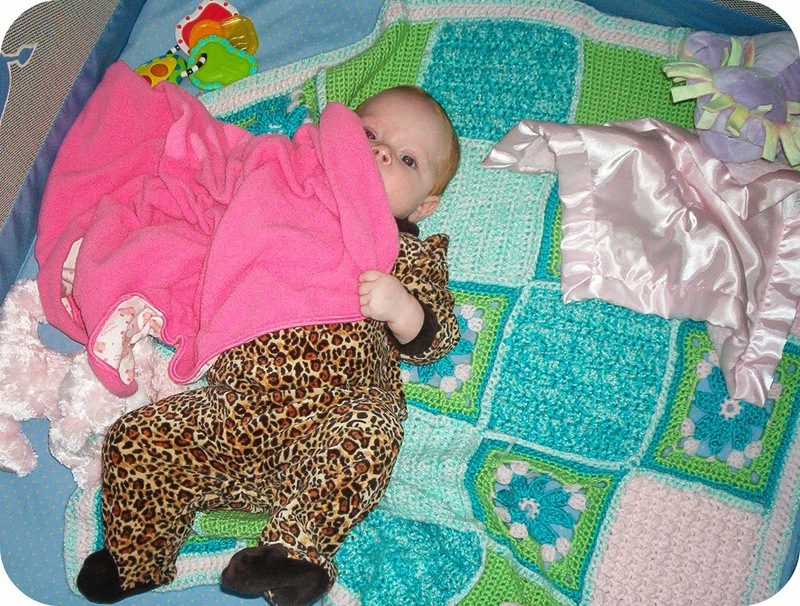 And did I bring up my hook for the circle fun granny squares I've decided to work on instead of this baby blanket? Oh! Wait, what was I saying? As you can see, I don't really have craft A.D.D. I haven't tried it, but I also haven't noticed hoop burn. Maybe it will help you though? Thank you for the link. I just read it all. I'm a little nervous about putting it through the washer since this was done by hand and I worry about the beads, but perhaps a hand washing would work? It's so inspiring reading how you're plowing through your list! Your excitement is contagious. :-) Congrats! Thank you, Kelly. I can't just say it was my idea. My husband told me no new projects, until I finish old ones. Perhaps living in a constant state of half-done has gotten to him. Hmmm. Oh! I almost forgot - I'm not a sewer myself but a former co-worker of mine has a cool sewing blog I wanted to share in case you find it interesting. :-) She's into vintage as well!